Product information "ALUKAP-XR Ridge Bar"
Attractive with long lasting strength! Robust aluminium capping with powder-coated Ridge Base and Top Capping, for sealing timber ridge beams. Accommodates varying roof pitches due to the Ridge Base curved gasket feet and ridge Top Capping's generous overhang protects from the elements and conceals connections with adjoining bars. 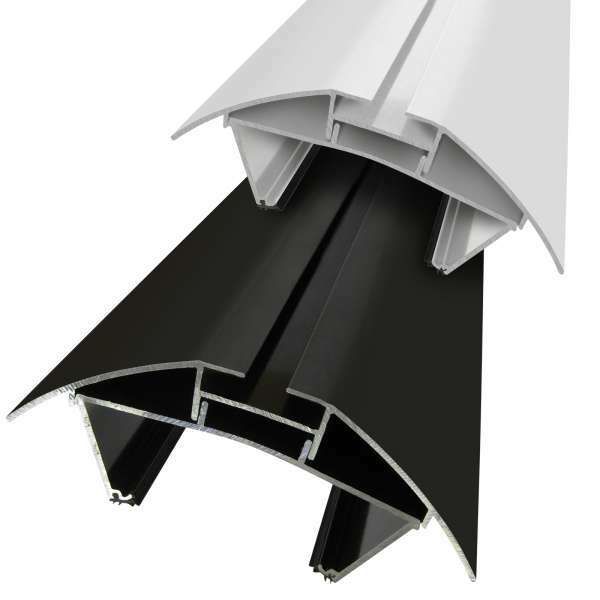 The Ridge is available in White, Dark Brown or custom RAL colour and a choice of lengths. Offer the Top Capping up to check length before snap-fixing in place* as the Top Capping is designed to be difficult to remove once fitted. * A rubber or plastic hammer can be used to snap the Top Capping onto the Ridge Base. Avaiod heavy impact and be sure that both sides are fully engaged along the length. Mechanical fixings can be used with Top Capping if required..
Related links to "ALUKAP-XR Ridge Bar"
Customer review for "ALUKAP-XR Ridge Bar"